The event is a mini concert and club rave rolled up in one. The event intends to introduce the Nigerian entertainment scene to the club rave, which is basically features a cross-over crowd musicians, fashionistas, and clubbers. 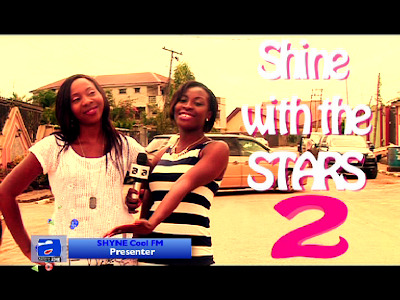 “SHINE WITH THE STARS” which the series 2 theme is 'Celebrity Pool Rave' will also feature short comedy skits from renowned comedians. Party-goers will also be able to take home a piece of the fun and action as there will be numerous special prizes up for grabs in one-of-a-kind games. The red carpet event would also have musical performances. The maiden edition of quarterly event would take place on Saturday, August 25th 2012, at Hotel Bon Voyage, 57A Ajay Morino Drive, off Tony Anagbede Street, Victoria Island Lagos. Confirmed stars include: Ali Baba, Dammy Krane, chuddy k, Tillaman, Chidinma, Illbliss,Rayce, Dipp, Kennis music all stars, David Nnaji, Tha Suspekt, Kween, Ashiwaju, Damola Cruz, Yaw, Rosemary(Artistezone), Dj Jimmy Jatt, Efe Tommy. Proudly supported by; Artistezone, STV, Soundcity, Coolfm, Naija Edition, Hair Fussion. SHINE co-anchors the ‘Good Morning Nigeria Show’ from 5am-10am and the weekend afternoon show – ‘Sunday Chillout Zone Show’ 2pm-7pm on Cool FM 96.9 Lagos which is the 7th radio station she has worked now. Her radio experience also includes radio stations outside Lagos. catch up with Shyne alonside Rosemary today by 2:30pm on Artistezone/STV for more details.